a CacheManager - the menu system for interacting with squid. This is currently just an adapter to the global cachemgr* routines to provide looser coupling between modules, but once fully transitioned, an instance of this class will represent a single independent manager. TODO: update documentation to reflect the new singleton model. Definition at line 30 of file CacheManager.h. Definition at line 33 of file CacheManager.h. Definition at line 52 of file CacheManager.h. References CheckPassword(), ParseHeaders(), ParseUrl(), PasswdGet(), and registerProfile(). Definition at line 424 of file cache_manager.cc. References assert, Config, NULL, and SquidConfig::passwd_list. Referenced by Mgr::MenuAction::dump(), and menu(). 0 if mgr->password is good or "none"
1 if mgr->password is "disable"
Definition at line 276 of file cache_manager.cc. References action(), assert, Config, debugs, NULL, Mgr::Command::params, SquidConfig::passwd_list, Mgr::ActionParams::password, Mgr::Command::profile, and String::size(). Definition at line 128 of file cache_manager.cc. Referenced by Mgr::Response::Response(), and testCacheManager::testRegister(). Definition at line 141 of file cache_manager.cc. References Mgr::ActionParams::actionName, Must, NULL, and String::termedBuf(). Referenced by Ipc::Strand::handleCacheMgrRequest(), and Ipc::Coordinator::handleCacheMgrRequest(). Locates an action in the actions registry ActionsList. Definition at line 110 of file cache_manager.cc. References a, debugs, Must, and NULL. Definition at line 466 of file cache_manager.cc. References debugs, instance, and Mgr::RegisterBasics(). Referenced by Mgr::MenuAction::dump(), Ipc::Strand::handleCacheMgrRequest(), Ipc::Coordinator::handleCacheMgrRequest(), internalStart(), menu(), Mgr::RegisterAction(), Mgr::Response::Response(), FwdState::Start(), testCacheManager::testCreate(), and testCacheManager::testRegister(). Definition at line 44 of file CacheManager.h. References ActionProtection(), GetInstance(), menu_, request(), and start(). Definition at line 236 of file cache_manager.cc. References assert, Http::AUTHORIZATION, DBG_IMPORTANT, debugs, HttpRequest::flags, HttpHeader::getAuth(), Http::Message::header, Mgr::ActionParams::httpFlags, Mgr::ActionParams::httpMethod, HttpRequestMethod::id(), String::limitInit(), HttpRequest::method, Mgr::ActionParams::password, and Mgr::ActionParams::userName. define whether the URL is a cache-manager URL and parse the action requested by the user. Checks via CacheManager::ActionProtection() that the item is accessible by the user. Definition at line 159 of file cache_manager.cc. References DBG_IMPORTANT, debugs, HERE(), len, LOCAL_ARRAY, MAX_URL, Must, NULL, Mgr::QueryParams::Parse(), request(), and xstrncpy(). Definition at line 447 of file cache_manager.cc. References Mgr::ActionPasswordList::actions, Mgr::ActionPasswordList::next, NULL, and Mgr::ActionPasswordList::passwd. Registers a C-style action, which is implemented as a pointer to a function taking as argument a pointer to a StoreEntry and returning void. Implemented via CacheManagerActionLegacy. Definition at line 79 of file cache_manager.cc. References action(), ClassActionCreator::ClassActionCreator(), debugs, ClassActionCreator::handler, and HERE(). Referenced by CacheManager(), Mgr::RegisterAction(), and testCacheManager::testRegister(). Definition at line 61 of file cache_manager.cc. References debugs, findAction(), HERE(), Must, and NULL. 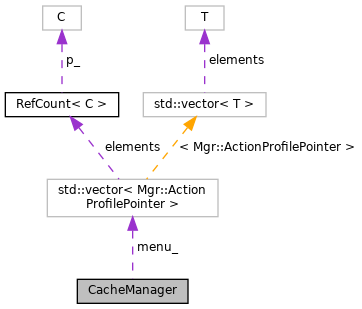 Main entry point in the Cache Manager's activity. Gets called as part of the forward chain if the right URL is detected there. Initiates all needed internal work and renders the response. Definition at line 306 of file cache_manager.cc. References action(), ErrorState::BuildHttpReply(), StoreEntry::complete(), DBG_IMPORTANT, debugs, ERR_CACHE_MGR_ACCESS_DENIED, ERR_INVALID_URL, errorAppendEntry(), StoreEntry::expires, HttpHeader::getStr(), HttpHeader::has(), Http::Message::header, IamWorkerProcess(), MGR_INDEX, Must, NULL, Http::ORIGIN, Http::ProtocolVersion(), HttpHeader::putAuth(), HttpHeader::putExt(), StoreEntry::replaceHttpReply(), Http::scNotFound, Http::scOkay, Http::scUnauthorized, Http::StatusLine::set(), HttpReply::sline, squid_curtime, AsyncJob::Start(), StoreEntry::url(), ErrorState::url, UsingSmp(), and xstrdup. Referenced by internalStart(), menu(), and FwdState::Start(). Definition at line 61 of file CacheManager.h.